- Roy Hodgson, March 2013. Sound familiar? We’ve heard it all before from Roy. This time a 1-1 draw in Montenegro, snatched from the jaws of victory following a second half that encapsulated the passive style that Roy Hodgson sides display. It’s the same story, just a different day. Hodgson’s distorted perception of reality is nothing new – this appraisal of a poor performance against Ukraine was on a par with his belief in October 2010 that Liverpool’s 2-0 derby defeat at Goodison Park was their best of the season. “If it’s a dog fight, then it’s a dog fight. There’s nothing wrong with that. The good thing is that if it is a dog fight, we know we can stay and take part in a dog fight. We took part in a few during the Euros and we certainly dug in against Poland and showed the right sort of character and the right type of determination. 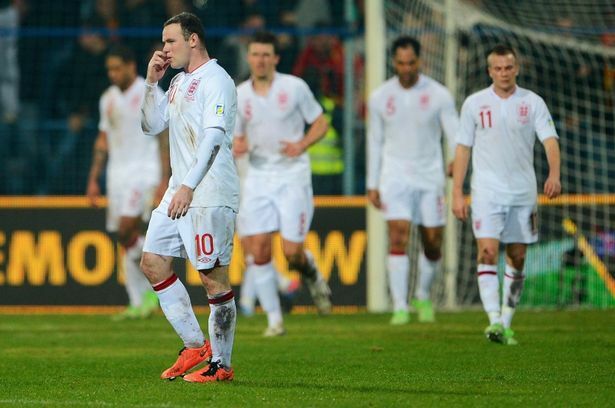 After four games of the qualification process, two of which had been against whipping boys Moldova and San Marino, Hodgson had already admitted defeat and verbally transformed a group consisting of Montenegro (28th in FIFA rankings), Ukraine (48th) and Poland (61st) into a proverbial ‘dogfight’. This is not realism, this is defeatism. His admission that England were ‘robbed’ of victory in Montenegro lent credence to the theory that nothing could be done to stymie the Montenegrin ambush in the second period. Indeed, with Alex Oxlade-Chamberlain, Scott Parker, Frank Lampard and Daniel Sturridge sitting on the bench, what on earth could Hodgson have done during Montenegro’s ‘good spell’? 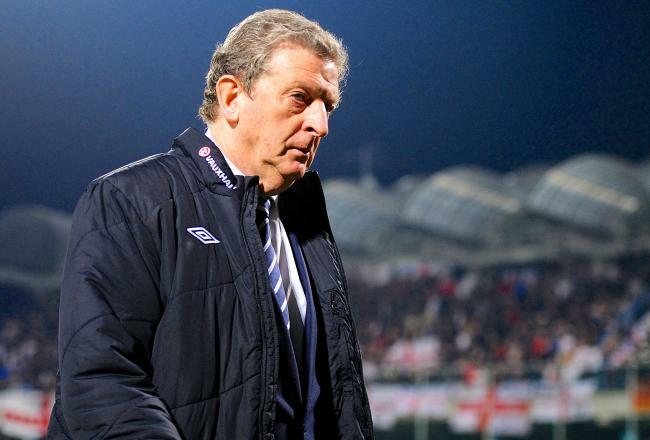 Hodgson later conceded that there were ‘no obvious changes’ that he could have made. It beggars belief that an international manager can sit on the sidelines, watch and do nothing, because to make tactical alterations would be to tamper with the sacred shape and system; inertia reigns supreme. At half-time Branko Brnovic introduced South Korean footballing demi-god Dejan Damjanovic, facilitating a change in formation that saw Stevan Jovetic drop deeper behind the front two. Any connoisseur of Monday Night Football knows that such a tactical tweak would not bypass the mind of Gary Neville, but he is powerless to adjust the system and shape that oozes Hodgson. In this sense, the altar of Hodgson is one of the most peculiar phenomenons in the footballing landscape. The media fascination with his managerial stint at Fulham bought him the big money move to Liverpool that he craved. It cultivated a Hodgson myth that perpetuates and seeps through the mainstream media; he reads books and speaks multiple languages, therefore he is learned, and anyone who reads widely instantly becomes a footballing tactical mastermind, right? In reality it paints a distressing image of what we expect in English society, but that discourse is for another day. Upon his inevitable unveiling as successor to Fabio Capello in April last year it bought him a lengthy honeymoon period that saw him absolved of blame for England’s pitiful performance against Italy in the quarter finals of Euro 2012. The warning signs were there when an unrelenting Hodgson allowed Pirlo the freedom of Kiev, as he had Charlie Adam when Blackpool humbled Liverpool at Anfield in October 2010. ‘It’s ok’ they assured us, Hodgson’s methods will bear fruit. He’ll imprint his style on this England side soon enough – the major international tournament that Fabio Capello breezed through qualification for was just an experiment in damage limitation. Capello, so willfully discarded by the FA, has guided Russia to four back-to-back victories in their qualification group, which includes a victory over Portugal. His 67% win ratio as England manager remains perennially overlooked and underestimated. In 10 competitive internationals Hodgson has won five; three against Moldova, San Marino and San Marino (131st and 207th in the FIFA rankings). The three matches against major opposition in their qualification group for Brazil 2014 have yielded dispiriting 1-1 draws that have conformed to type. Hodgeball is constant and fully formed, it will and can never divert. The displays against Montenegro, Ukraine and Poland have characterised his management in a microcosm. There is no in-game management, no imagination nor ingenuity. Perhaps the mainstream media tide is beginning to turn? Like many others of his ilk, Adrian Durham prays at the sanctuary of Harry Redknapp and has gained a certain notoriety for his genuine belief that Redknapp would guide Queens Park Rangers to a higher finish than Tottenham under Andre Villas-Boas (at the moment that prediction is 31 points off being correct with eight games to play, you do the maths). On an evening that may well have decimated England’s hopes of World Cup qualification this is pretty mild opprobrium. The media are beginning to reap what they so stringently sowed, as it begins to unravel the backlash is slowly uncoiling. Hodgson reiterated his belief that England’s destiny – the road to Rio – is in their own hands. But when your own hands treat possession of the football akin to a hand grenade, then this mantra is hardly an encouraging one – particularly for someone who is supposedly heading a root and branch reform of English football. This entry was posted in Analysis and opinion and tagged england, euro 2012, liverpool, montenegro, poland, Roy Hodgson, The FA, ukraine, world cup 2014 by James Dutton. Bookmark the permalink.